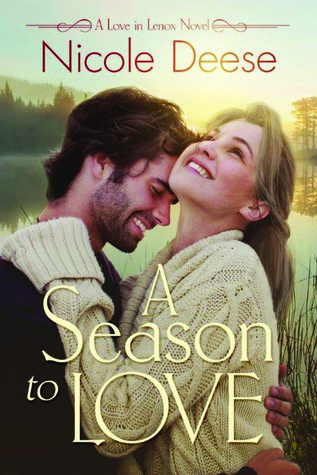 A Season to Love (2016) by Nicole Deese is book 2 in her Love in Lenox series. This book comes in all forms including eBook, and is 316 pages in length. With a full-time job and a very busy five-year old, this book took me two days to read. I checked this novel out through Kindle Unlimited to review. The opinions expressed in this review are my own. I give this book 5 STARS. A Season to Love is a Contemporary Christian Romance. This book is SO good. Run to Amazon (LOL!) and buy this book now. I could not put this book down for one second, and when I had to I was a little sad. The characters are beautifully written, the story line is very engaging and fast-paced, but what I loved the most is the writing. Ms. Deese evokes so much emotion through her words. When Willa panics, I was panicking. When Willa was happy, I was smiling from ear to ear. And, when Willa’s heart breaks, I was angry and weepy right there next to her. I love when a book allows me to run the gamut of emotions right alongside its characters. There is nothing quite like being a fearful person. The constant worry, the doubts, the panic attacks, waiting for the other shoe to drop. You are sure something bad is waiting just around the corner every single day. And, when the day is over and nothing bad has happened, you are relieved for about a minute, but then you start to stress about tomorrow. It’s one of the most awful and exhausting feelings in the world. Fear becomes so real, like a person standing next to you whispering awful thoughts into your head. You start to feel a little crazy! The person experiencing this level of fear needs control. It’s why OCD exists. If I can control every aspect of my day, and follow a set pattern, I can beat fear. But, the truth of the matter is, the only way to defeat fear is to give it over to Jesus, which is way easier said than done. Willa is a fearful person, but she has promised her seven-year old daughter that she would be more brave. A task that is proving rather difficult for Willa. At the start of this story, Willa is so tightly wound and so scared about everything that I started to feel stressed out. Her daughter, Savannah, just finished her last rounds of cancer treatment and has been cleared to go back to school and be a normal kid. But, Willa’s fear meter is on RED. At the first sign of a sniffle, Willa gathers her child and runs her to the doctor’s office. Enter Dr. Patrick McCade. Patrick is a rover. He doesn’t stay in one place for very long. In fact, he is only in Lenox for a few months to help out at his father’s family practice while his dad is in Scotland visiting family. He has ZERO plans to stay in Lenox after his father returns. Patrick is seemingly brave: no mountain is too high and no river is too rough. He wants to see the entire world, and he never plans to put down roots. As Willa and Patrick become friends, and Patrick helps Willa with her bravery promise, they both realize their hearts are quickly becoming entangled. Will Willa be able to entrust her fears totally to Jesus, and allow room in her heart for Patrick? Will Patrick be able to make room in his very adventurous life for a beautiful woman who has planted thick roots in her community? Is it possible for these two to find real love? You will have to read the book to find out! A Season to Love is a fantastic book, and I cannot recommend it enough. If you are looking for a great read this holiday weekend, then I suggest this book. You will not be disappointed. Ah now I’m even more excited to get to this eventually! I have some review books to get through 1st, but I will be picking up with this series as soon as I can! I’m so glad to hear you loved it. I hope you enjoy it when you can get to it. Good luck with your review books. Hope they’re fun! Thank you, I think they will be!